I’m about to head to the airport to pick up my super fab mom and figured it was the perfect time to do a quick, but thoughtful DIY gift post for any of you who are scrambling for a thoughtful gift. Just follow this simple DIY to create a simple gift that is both thoughtful and easy to do! Cigar Boxes :: Specialty cigar stores give these beautiful boxes away for free or you can check out your local goodwill or vintage flea market. 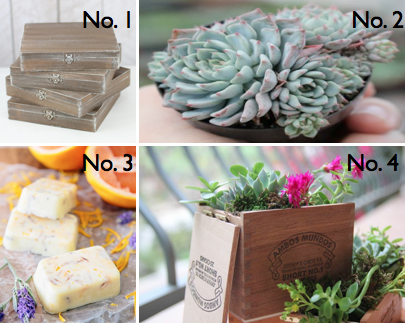 Potted Plant :: Select one of her favorites such as succulents, herbs, her favorite flower, or even a vegetable plant. Something to Pamper: Choose items such as artisan soaps, specialty lip balm, scented candles or bath products that your mom will surely appreciate. 1) Clean out your cigar box and remove labels. You can dust off excess dirt with a paint brush and use a wood specific cleaner or stain to add some shine. 2) Place the potted plant inside the cigar box taking into account plastic lining or a tray should the pot have draining holes. Succulents are low maintenance and great for busy moms, herbs and vegetable plants are perfect for mom who love to cook, or a favorite flower like a petite orchid cant add the perfect personal touch. 3) Strategically place additional gift items, such as soaps or candles, around the plant. This is your chance to to make the gift tailored to her, so get creative! 4) Lastly, wrap the gift with some ribbon or twine and a personal card. On behalf of the LGY Team, Happy Mother’s Day! Photos courtesy of http://www.etsy.com/shop/braggingbags, http://www.thesucculentsource.com, http://www.ahouseinthehills.com & LGY staff member Jeneeka.